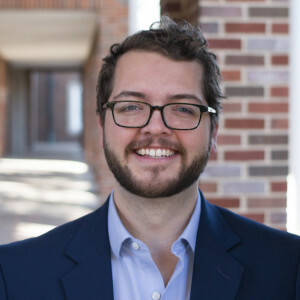 Guest Blogger Zach Light-Wells in an Associate Director of Music at Preston Hollow Presbyterian Church in Dallas, Texas, and is earning a Master of Sacred Music in Choral Conducting from Perkins School of Theology and Meadows School of the Arts at Southern Methodist University. So, why is there a band in the sanctuary? For me, it’s difficult to imagine a world without music. How is it that on the busiest of days, when I can’t seem to remember what I had for dinner the night before, I’ll find myself humming a tune that I haven’t heard in a decade? How can we forget important anniversaries and birthdays but still remember every note of a melody we sang during advent years ago? Oddly enough, music simply isn’t bound by time: music existed long before we took our first breaths, and music will continue to be part of the earth’s existence long after we each pass on. So, where did this mysterious, untameable medium come from? In the beginning, when God hovered over the waters of creation, God spoke the universe into order, day by day, night by night, in sequence (Genesis 1). Intentional, rhythmic, and divinely improvised, God’s cadence of creation—God’s own song of life —stirred the cosmos into existence. From the depths of the earth to the furthest frontiers of the universe, God continues to create: to sing and paint the universe into being. Created in the image of our own Creator, we, too, are called to be restless: to be co-creators in an ever expanding universe. In music-making, we participate in God’s active, vibrant re-creation of the earth. In music-making, we fulfil our divinely inspired vocation. Music will continue to be part of the earth’s existence long after we each pass on. But, who exactly benefits from music-making: the songwriter, the listener, the participant, human or the divine? If we recognize music-making as an intrinsic human activity, must we classify music-making solely as an instinctual human obligation? In other words: if music-making, or creating, is woven in to the DNA of humankind, is the aim of music-making simply the fulfilment of human instincts, or are there more significant purposes for making music within the walls of our sanctuaries? According to the apostle Paul, music serves two primary functions: to serve God and to serve neighbor. “Be filled with the Spirit in the following ways: speak to each other with psalms, hymns, and spiritual songs; sing and make music to the Lord in your hearts” (Ephesians. 5:18-19, CEB). Perhaps intentionally, Paul reflects Jesus’ summary of the law found in the gospels: when asked “what is the greatest commandment,” Jesus responds “you must love the Lord your God with all your heart, with all your being, with all your mind, and with all your strength… you will love your neighbor as yourself. No other commandment is greater than these” (Mark 12:30-31, CEB). Just as we seek to serve both the God and neighbor in our daily lives, we seek to serve both God and neighbor in our music-making, for even the angels sang “glory to God in the highest, and on earth peace, good will toward men” (Luke 2:14, KJV). Hymnist Fred Pratt Green describes making music for the service of God particularly, declaring “when in our music God is glorified, and adoration leaves no room for pride, it is as though the whole creation cried: Alleluia!” When the bible mentions music-making, it’s most commonly describing an act of praise, in which music-making glorifies God: “O sing to the Lord a new song; sing to the Lord, all the earth. Sing to the Lord, bless his name; tell of his salvation from day to day” (Psalm 96:1-2, NRSV). Throughout scriptures, in recognizing the abundance of the Creator, creation is expected to worship God with music; “Let the earth be glad; let the sea resound, and all that is in it. Let the fields be jubilant, and everything in them; let all the trees of the forest sing for joy. Let all creation rejoice before the Lord…” (Psalm 96:11-13, NIV). When we offer God our praise, we acknowledge the beautiful complexity of the Creator, while simultaneously acknowledging the beautiful complexity of God’s creation. When we offer praise, we recognize God’s supreme love for all of creation. When we offer praise, we revel in the cosmic mysteries of God, while simultaneously thanking God for the abundant blessings in our lives. When we celebrate the goodness of God, God hears our songs— our very own musical creations— and, in our joy, God sings with us. When I say “our songs,” I should clarify that musical creativity isn’t merely reserved for songwriters and composers. In many ways, a worship band or sanctuary choir constantly explores the act of creating. In each moment of music-making, whether rehearsed or improvised, pre-written or spontaneous, each musician contributes musical ideas specific to that very moment in time. Because each musician adds their own unique, independent musical interpretation to the whole, each moment of group music-making is inherently distinct: never will the same sonic landscape, instruments or voices, or the same exact combination of vibrations and stillness exist again in time. When an entire congregation sings an ancient or pre-existing melody, the assembly invokes the voice of the original songwriter while collectively embodying a new musical idea. Regardless of the musical intent of original composers and songwriters, communal music-making brings new music into being, unique in both time and space. 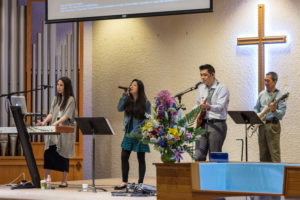 For this reason, congregational music is distinct among all elements of the Christian liturgy: congregational music invites neighbors into a corporate and immediate act of creation. Communal music-making, then, is exactly that: making, creating, and re-creating. In communal music-making, we mirror God’s song of creation: we perform an act that is intangible, vast, and transcendent. When we make music together, we offer our unique selves to our neighbors. While the result of our music-making may be a single, unified moment of sound, it is only achieved by the acceptance and inclusion of our differing voices and instruments. Just as the only requirement to receive communion is a willing heart, the sole requirement of music-making is the willingness to participate. Therefore, communal music creation is only made possible by the willingness to share the experience with others. Just as persons of all social statuses, gender identities, races, sexualities, skin colors, abilities, ages, and social classes are welcomed to the table, so, too, are all persons, voices, instruments, and abilities welcomed in to the song of the church. So, why is there a band in the sanctuary? To answer a question with a question: why shouldn’t there be? The style of music or the type of instruments involved have no bearing on our ability to make music together, it is only our unwillingness to join the song that prohibits us from singing. The good news is this: it doesn’t really matter what our music ends up sounding like, what’s important is that we are willing to make music together; what’s important is that we are willing to co-create with our neighbors and with our Creator. Congregational music invites neighbors into a corporate and immediate act of creation. In a society that is seemingly more polarized each day, are we still willing to create something together? Are we willing to create something unique, to give life to a new creation, together? Are we willing to share ourselves with our neighbors? Are we willing to share ourselves with God? Are we willing to sing the songs of the whole church, of the whole world, and of all of creation? A hymnist once penned, “and from morn to set of sun, through the church the song goes on.” As for me, it’s difficult to imagine a world without music. Great article. We are kindred spirits. If pipe organs were good enough for Jesus, why aren’t they good enough for us?